Depressed oil prices, rampant corruption, and pipeline vandalism are only parts of Nigeria's oil problem. 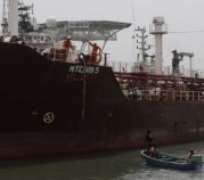 It's now losing a massive 400,000 barrels of crude daily to pirates in the Gulf of Guinea, an amount equal to the entire daily export capacity of its Forcados terminal. Overall damage from piracy, theft and fraud for Africa's largest oil exporter is estimated at some $1.5 billion a month, according to U.S. deputy ambassador to the UN, Michele Sison, citing a Chatham House report. Attempts by local governments and the UN to put a stop to piracy have met with some success, but the practice continues — shifting location and adapting to new security measures, so now the UN Security Council is calling for a comprehensive framework of measures aimed at eradicating it. Since 2014, says the UN, Gulf of Guinea piracy has increased at an alarming rate. Two pirate attacks on April 11 affected seven countries. The cargoes came from Nigeria, Turkey and Greece; the ships were flying Maltese and Liberian flags; and the 8 missing crewmen were from the Egypt, the Philippines and Turkey. In the first quarter of this year alone, there were six recorded pirate attacks in the Gulf of Guinea, and six attempted attacks. Nine of those were off the coast of Nigeria, while one was off the coast of Côte d'Ivoire, and two were within the territorial waters of the Democratic Republic of the Congo. Last year, there were 100 similar incidents in the Gulf of Guinea, according to the UK's ambassador to the UN, Peter Wilson. Dealing with the pirates requires an international effort, and particularly a coordinated effort by those countries near the Gulf of Guinea. There isn't much Nigeria can do on its own. Without a major overhaul of intelligence sharing and local law enforcement collaboration and training, the piracy scourge will continue to worsen. Nigeria has thrown its lot in the fight against pirates, but it has too much on its plate already. Plagued by low oil prices, pipeline vandalism and stalling reforms at its state oil company, the country has more than enough to worry about in addition to losses to pirates. In March, Nigeria pumped 1.677 million barrels of crude, which was a decline on the previous month's 1.744 million. According to a Financial Times analysis, the decline is set to continue over the coming years, largely because the reforms at the NNPC, pledged by new president Muhammadu Buhari to tackle long-time corruption and inefficiency, have so far not yielded any actual results. In addition to dealing with corruption, as part of the reforms, Buhari's government planned to change the terms of the production-sharing agreements it has with foreign oil companies operating in the country. Oil majors with a Nigerian presence said at the time that such a move could deter investments and ultimately have a negative effect on oil revenues. All in all, Nigeria has sunk deeper and deeper, and even a continued oil price rally would not be sufficient to prop it up as production continues to decline. For June, Nigeria plans to export 1.57 million barrels of crude, for instance, compared with 1.6 million barrels scheduled to leave its shores in May. What's more, its budget for 2016 had envisaged a daily output of 2.2 million barrels—an amount unlikely to be reached in the short-term. Disputes between the NNPC and foreign oilfield operators are hampering normal output at more than one field. That's in addition to the growing nervousness among international oil companies regarding Nigeria's ability to ensure the stability of production and revenue sharing. Vandals are responsible for an estimated 250,000 barrels in daily losses. Pirates are stealing at a rate of 400,000 barrels per day. That's a 650,000-barrel shortage on the budgeted daily output. So–barring all conscious effort on the part of the Nigerian government—prices will have to rise more substantially than they have so far this year for Nigeria to feel any positive effect.